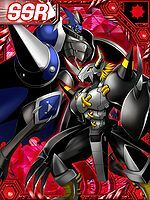 A Virus-species War Greymon feared as the "Jet-black Dragon Warrior". 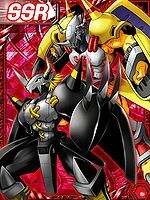 Although its creed and principles are the polar opposite of those of the Virus Buster War Greymon, it exists for the sake of its own peculiar "Justice". 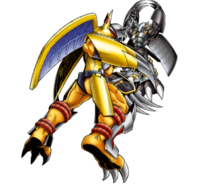 It detests cowardice and foul play, and it doesn't consider itself a fellow of vulgar Digimon, even if they are of the same Virus-species. The full details of how it converted to a Virus are a mystery, and the "Brave Shield" equipped to its back is not engraved with the Crest of Courage. 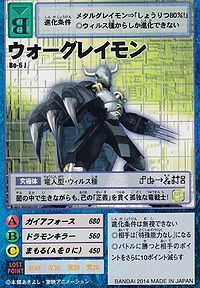 Its Special Move is similar to War Greymon's "Gaia Force", except that it takes all of the "negative emotions" within this world and concentrates them into one spot, and then fires it (Ankoku no Gaia Force). 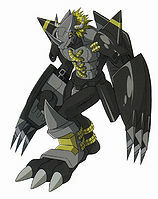 — Digimon Adventure 02: "The Dark Ultimate, Black War Greymon"
A Digimon that is feared as the Jet-black Dragon Knight. It is a mystery as to why it turned into a Virus. 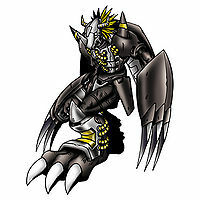 It hates cowardice, and will not think of vulgar Digimon as its comrades even if they are also of the Virus attribute. Title: 「漆黒の竜戦士」 — "Jet-black Dragon Warrior"
2) adj., Wearing clothing of the darkest visual hue: the black knight. 2) v.intr., Meaning old or ancient. 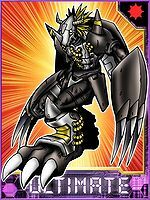 Anime/Manga Digimon Adventure 02: "The Dark Ultimate, Black War Greymon"
ガイアフォース Gaia Fōsu Terra Destroyer/Terra Force/Gaia Force Concentrates atmospheric energies into a giant fireball. 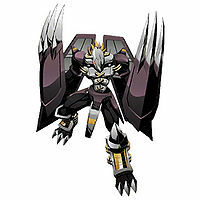 Inflicts physical damage with its Dramon Killer gauntlets; very effective against Dramon-type Digimon. 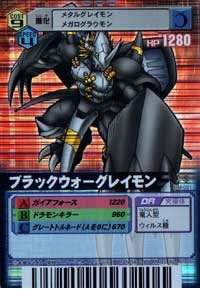 グレートトルネード Gurēto Torunēdo Black Tornado/Great Tornado Summons a tornado. 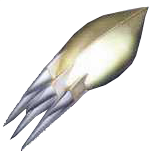 Spins and becomes a black tornado to drill through the target. Runs forward, charging into the opponent. 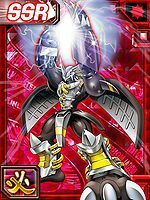 Ankoku no Gaia Force  Dark Gaia Force 暗黒のガイアフォース Ankoku no Gaia Fōsu Dark Terra Force Concentrates negative karma into a giant dark fireball. Also called Gaia Force D in some video games. ドラモンファイアー Doramon Faiā Doramon Fire Shoots fireballs from its hands. 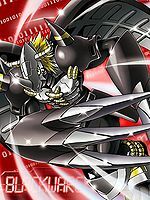 ブラックストームトルネード Burakku Sutōmu Torunēdo Ultra Tornado Generates huge tornadoes around itself. Fires a Gaia Force while in the air. 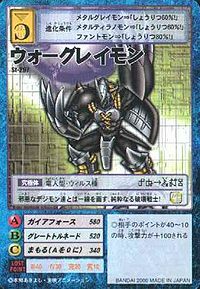 ドラモンバスター Doramon Basutā Dragon Crusher Drops straight down from above, stabbing with a Dramon Killer. Gathers energy in its hands and fires a series of explosive fireballs. Uses its Brave Shield to defend. 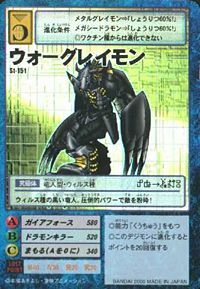 By combining 100 Dark Towers, Archnemon created Black War Greymon. 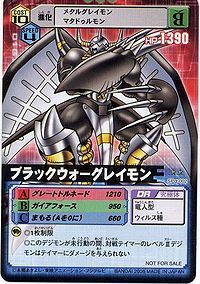 Black War Greymon is the last opponent in the game, that appears in Beginner City's Battle Cafe if you have beaten Metal Garurumon (Virus). His card isn't in-game. 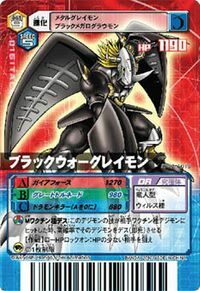 Black War Greymon is an unlockable character, with no evolutions. 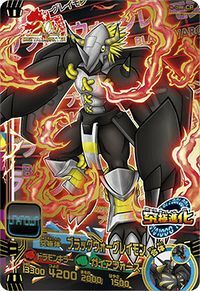 His abilities are effectively the same as War Greymon's. 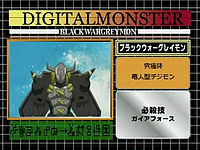 Black War Greymon is a playable character. 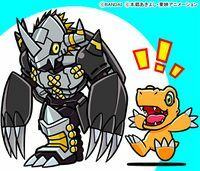 It is the evolved form of Agumon (Black). 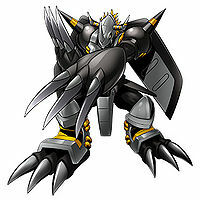 Black War Greymon is an obtainable digimon as well as an optional boss character. He evolves from Skull Greymon. 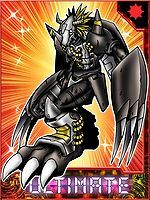 Black War Greymon is an obtainable Digimon. 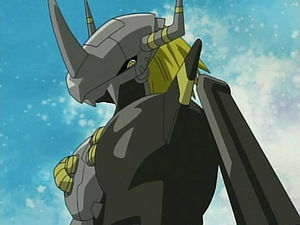 Evolves from Skull Greymon. 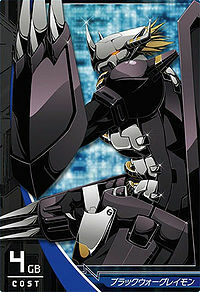 Black War Greymon is a playable character. 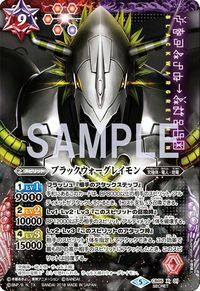 Can be evolved from Metal Greymon if above level 42 and Darkness EXP above 8000, or can be found at Core Field. Can be evolved from Vermillimon if above level 58, spirit 290, and Darkness EXP 21000, or can be found at Trans-field. 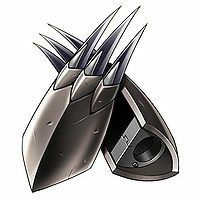 Can also be obtained by Jogressing Skull Greymon with Allomon or Black Megalo Growmon with Megadramon if above level 53, Dark EXP 18000, Spirit 320. 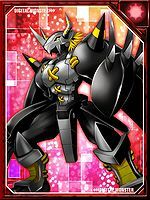 Can be evolved from Cyberdramon or Metal Greymon Virus. 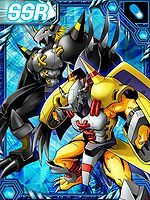 Digimon Adventure 02's BlackWarGreymon appears as part of the anime's 20th anniversary event. Appears in Area 01 as the boss. 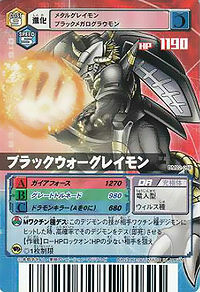 A black, Virus attribute Dragon Man, it pulverizes its enemies with its overwhelming power! It draws a line between itself and other evil Digimon, a warrior of pure destruction! Even as it lives in the darkness, this lone dragon warrior pierces through with its 'justice'! The successor of the blood of the virus!! This jet-black dragon warrior pursues only its own justice. Although the Crest of Courage has disappeared from its Brave Shield, it still retains the pride of a warrior, and longs for the meaning of possessing a heart. 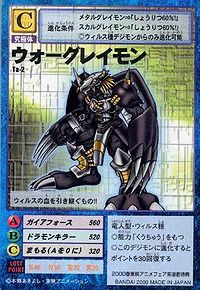 This aloof Digimon is feared as the 'Jet Black Dragon Warrior'. It only moves according to its own justice and beliefs, and will never acknowledge cowards. It continues to long for and search for the meaning of its existence. 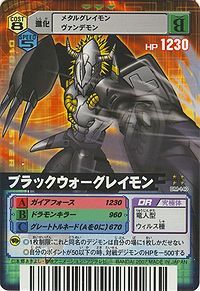 A Virus attribute War Greymon whose entire body has turned black. 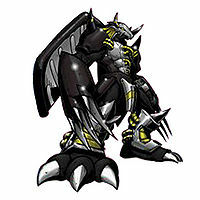 It despises cowards and foul play, fighting only in accordance to its own justice, a rarity among Virus Digimon. 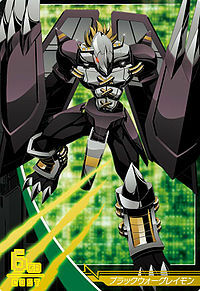 A Virus-species War Greymon feared as the "Jet-black Dragon Warrior". 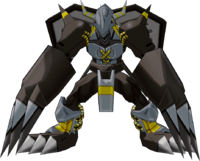 Black War Greymon appears as an enemy Digimon in the Arcade component of the game through a special 20th Anniversary event. 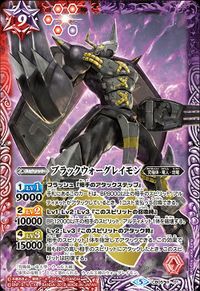 ↑ Digimon Adventure 02: "Assault on Black War Greymon"
↑ Digimon Adventure 02: "Gigantic Ultimate, Qinglongmon"
↑ Digimon Adventure 02: "The Dark Ultimate, Black War Greymon"
This page was last modified on 21 February 2019, at 14:22.